The Thunderbird pilot, Capt. Chris Strickland, safely ejected at the last second before his F-16C Falcon crashed and burned about 500 yards from the airshow crowd. 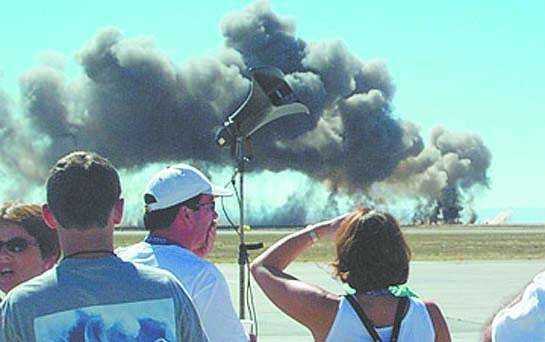 A stunned crowd of perhaps as many as 50,000 people watched in silent horror Sunday as the last plane to launch for the USAF Thunderbirds airshow at Gunfighter Skies 2003 crashed and burned. No one was hurt, but the incident overshadowed what organizers had been calling the best airshow at the base, ever. The pilot, Capt. Chris Strickland, who ejected at literally the last second before his F-16C hit the ground, earned a huge ovation from the crowd as he stood briefly after parachuting to earth, just missing the hundreds of yards of smoke and flame that his aircraft and its 6800 pounds of jet fuel created after crashing in front of the control tower, just off the south runway about 1500 feet from the crowd. Then he collapsed, just as rescue crews were arriving. 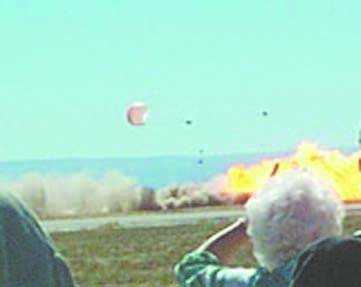 The crowd stood in stunned silence as they watch the Thunderbird aircraft explode in smoke and flames. Strickland was treated at the base hospital for minor injuries related to the stresses of a low-altitude ejection, and released later that night after calling his family to tell them he was OK.
Strickland had taken off as the sixth -- and last -- aircraft in the Thunderbird demonstration, the highlight event of the weekend airshow that saw an estimated 80-85,000 people attend during the two days of activities at Mountain Home AFB. He climbed almost straight up into the sky, then rolled out and began a Split-S, a basic maneuver that allows a pilot to rapidly reverse direction in the vertical plane. Instead of pulling out a couple hundred feet over the runway, the plane continued to lose altitude. Retired Col. Bill Richey, who flew fighter jets for 25 years, was standing in the VIP section along with airbase officers and civilian dignitaries. "I thought the way he was coming down the backside (of the Split-S) that he didn't have an arc that was normal." With his experienced eyes, he saw something few in the crowd saw at that point. "You could tell something wasn't right. I kept saying to myself, 'pull out, pull out, pull out.' Then the plane hit and I was just looking for his chute. I was glad to see it." Mountain Home News reporter Judi Devol, who was on vacation and simply enjoying the show with her family, saw it the way most of the rest of the non-fliers in the crowd saw it. "The F-16 came in low, passed in front of our stand, when suddenly we saw the pilot ejecting, with parts of the plane flying from the front and then the plane hitting the ground, leaving a trail of fire and throwing pieces of the plane in all directions." The plane exploded in a fireball of flame and smoke that billowed hundreds of feet into the air. It took several seconds before the stunned crowd realized that what they were witnessing was not part of the show. "It was almost silent," Devol said. "No screaming or shouting, barely any talking at all -- not until we saw the pilot walking away from the field of destruction and waving to the crowd that the first words began to be heard. 'Look! There he is! He's walking!' "
A brief round of applause went up. As emergency crews began to respond, the crowd saw Strickland drop to the ground, "and again we held our breath," Devol said. "All day there had been aircraft demonstrating high-speed maneuvers, trailing smoke so the viewers could keep an eye on all of them. We had watched the Golden Knights jumping out of their plane, free falling for several seconds before releasing the canopies. "We had watched a simulated air attack, feeling the ground shake and the booms so deep we could feel them travel through our bodies; then a huge wall of flame went up from the ground and dark oily smoke filled the air. "We had watched as the Pepsi Skywriter flew so close to a hang glider's streamers, that it appeared as through he had actually cut through the trailing ribbons. So as the F-16 crashed into the ground, it almost seemed as if it were a planned part of the program. It was surreal. It took seconds to realize that we had actually witnessed a horrible crash. Still nobody moved. We were mesmerized, unable to take our eyes from the huge wall of flames or the pilot." The Thunderbird announcer's voice came back across the loud speakers, understatedly noting, "It's obvious we have a problem," and asking people to remain behind the fence. Base airfield emergency crews began rolling to the scene almost immediately. Ironically, those crews had drilled just nine days before for such an accident, the exercise on Sept. 5 eeriely similar to what happened for real Sunday. Uniformed military personnel began walking in front of the spectators asking if anyone had recorded the crash to bring their camera with them and report to a special area that had been set up. Still few people moved. Then came the announcement that the rest of the demonstration had been cancelled and the request for everyone to leave the flight line. It was a somber crowd that filed back towards the gates -- very subdued and mostly quiet. The shuttle buses filled quickly and long lines formed to wait for another. Many people chose to walk to their parked cars. But everything seemed orderly. No pushing, no shoving, and just quiet murmurs running through the stunned crowd. Overhead the remaining five airplanes circled the field. The commander and lead pilot of the Thunderbirds, Lt. Col. Richard McSpadden, said when they saw the fireball, he immediately cancelled the maneuvers the rest of the formation was prepared to demonstrate and waited until the runway was clear of emergency vehicles before the team landed. He headed to the hospital where he talked with Strickland. "He made the right decision to get out, and we're thrilled with that." McFadden said safety always takes precedence over the performance, and denies that there were any prior indications the plane had any problem. "We do a maintenance check about four hours before every performance. If there are any questions, that plane gets pulled. That's why we bring spares with us." Col. Blair Hansen, the 366th Fighter Wing commander, noted that all of the safety systems and procedures worked, no one was injured, and other than the total destruction of the Thunderbird aircraft, there was no damage to the runway or any other facility on base. "A lot of good things happened," he said. "It could have been a lot worse." He had high praise for the fire and rescue teams. "I'm proud of the response of our people. It is a credit to their training" how quickly they were on the scene. The actual cause of the crash was not known by press time. Hansen said the next step was to preserve the scene "so we can provide a detailed and forensic analysis of the accident." An interim crash investigation team was immediately assembled and Hansen said a USAF Safety Board investigation would begin almost immediately "to determine the cause of the crash and make whatever changes are necessary to prevent such an accident from happening again." A Thunderbird spokesperson at Nellis AFB, the home base of the aerial demonstration team, said i the Thunderbirds would be grounded for at least two weeks. They were slated to fly this weekend at another airshow. It was the first major crash of a Thunderbird aircraft since 1994 when a plane crashed during a training flight. The last time a death occurred was in 1982 when the entire demonstration team, then flying T-38 Talons, was wiped out in a training accident that saw all six planes follow their leader into the desert outside Las Vegas. After that the team switched to the F-16 and had had no major incidents until last Sunday. Any ejection from an aircraft is dangerous, but Hansen said the ACES II ejection system used in the F-16C had saved a lot of pilots over the years in low-altitude ejections. The system is designed to be able to successfully launch a pilot who is sitting in a plane on the ground high enough into the air for his chute to deploy. Flying with the Thunderbirds is a highly sought assignment and only the best are selected for the two-year tours with the team. Strickland had joined the team late last year and began performing in airshows in March. Ironically, the last thing the flight safety officer for the airshow had told the performers in the Sunday morning briefing was, "don't fly it into the ground." Airshow performances are "a high risk business," said Alan Bermensolo, president of Silver Wings, which had helped sponsor the airshow. "You do everything possible to prevent it, but accidents happen." The accident marred what Bermensolo, Hansen, and almost everyone else associated with the airshow had been calling the best ever at the airbase. Excluding the final three minutes, "it was an awesome airshow," Bermensolo said. "It was a huge success. If the base wants us to do it again, we're committed to helping them." Silver Wings, a non-profit civilian group, was formed to help raise funds for performers and to assist base personnel with organizing the 2000 airshow on base. Financially, the group "just about broke even," in 2000, Bermensolo said, but utilizing the lessons learned, it was able to show a profit for its side of the operations this year. The profit will be used to create seed money for the next airshow, and to provide donations to charities such as Operation Warmheart, the Cheer Basket Project, and scholarships for local students. More importantly, Silver Wings and the airbase had learned a number of lessons about organizing an airshow. Bermensolo said many of the performers, who appear professionally every week at airshows around the country, told him it was the best organized airshow they had ever attended and was "a template for how it should be done." The events actually began Friday with a "mini" airshow at the "muni," the city's municipal airport. Although high winds threatened some of the activities, several acrobatic aircraft performed there, along with static displays and a concert. More than 3,000 people attended. Saturday and Sunday the focus shifted to the airbase where the two-day crowd was estimated at 80,000 to 85,000 people. The crowds enjoyed the static displays, walking through the huge AWACS and C-17 aircraft, and peering into the cockpits of the other aircraft on display. In the hangers, a wide variety of displays and games for children were available. Overhead, the crowd was treated to a continuous, seemingly non-stop, series of acrobatic performances in aircraft ranging from the wing's own F-15s to a rare Soviet-era MiG-17. The weather was beautiful both days and crowd movement on and off base was smooth, with few disruptions. Monday, the runways were closed, a scheduled move, while crews cleared debris left by the crowd on the north runway. Aircraft were not scheduled to fly out of the base until Monday night or Tuesday. Meanwhile, other teams of personnel scoured the desert between the south runway and the control tower seeking to recover parts from the F-16 as the accident investigation gathered steam.